The vast majority of Muslims surveyed subscribe to the basic tenets of Islam – that there is only one God and that Muhammad is His Prophet. Acceptance of these central articles of the Islamic faith forms the foundation of a global ummah, or community of believers. But it does not necessarily follow that religion plays an equally prominent role in the lives of all Muslims. Indeed, the survey finds that religion’s importance in Muslims’ daily lives varies greatly across the six major geographic regions included in the study. In sub-Saharan Africa, Southeast Asia and South Asia, at least eight-in-ten Muslims in every country surveyed say that religion is very important in their lives, while in the Middle East and North Africa the comparable percentages range from 59% in Lebanon to 89% in Morocco. In Central Asia and across Southern and Eastern Europe (Russia and the Balkans), no more than half of Muslims describe religion as central to their lives in any country surveyed except Turkey, where 67% say religion is very important to them. Other measures of religious commitment follow a similar pattern. In four of the six regions included in the study – the Middle East and North Africa, Southeast Asia, South Asia and sub-Saharan Africa – a majority of Muslims in most countries surveyed pray several times a day, including three-quarters or more in 12 countries who say they perform all five salat daily. By contrast, across Central Asia and in the four countries with substantial Muslim populations surveyed in Southern and Eastern Europe, only in Azerbaijan do a majority of Muslims (70%) report praying several times a day (including 21% who say they perform all five salat). In the other countries in these two regions, far fewer Muslims, including 7% in Albania and 4% in Kazakhstan, say they pray several times a day. Because having the opportunity to pray is generally unrelated to gender, income or literacy, it is perhaps the most universal measure of religious commitment among Muslims. The survey also explored other forms of religious engagement, including mosque attendance and reading or listening to the Quran, which may not be equally available to all Muslims. In both instances, the same pattern holds: levels of commitment tend to be significantly lower among Muslims in Central Asia and across Southern and Eastern Europe. It is only when it comes to almsgiving and fasting during Ramadan that there are less pronounced differences between Muslims in Central Asia and in Southern and Eastern Europe and those in other regions. For example, the percentage of Muslims who say they give zakat, or annual donations to benefit the poor and less fortunate, is as high in countries such as Bosnia-Herzegovina (81%), Kyrgyzstan (77%), Uzbekistan (73%) and Turkey (72%) as it is in many other nations surveyed. Profession of faith, or shahadah. By testifying that there is one God, and Muhammad is His Prophet, an individual distinguishes himself or herself as a Muslim. Praying, or salat. Muslims are supposed to pray five times a day – at dawn, noon, mid-afternoon, sunset and evening. The shahadah is repeated at each call to prayer and closes each prayer, as well. Giving of alms, or zakat. All adult Muslims who are able to do so are required to make an annual donation to assist the poor or less fortunate. The amount is typically 2.5% of a person’s total wealth, not just annual income. Fasting during the holy month of Ramadan, or sawm. Throughout the month of Ramadan, when the Quran was first revealed, all physically fit Muslim adults are to abstain from food, drink, smoking and sexual activity from dawn to dusk. Pilgrimage to Mecca, or hajj. At least once in a lifetime, Muslims who are physically and financially capable of making the journey are expected to visit Islam’s holiest city, Mecca, and perform rituals associated with the hajj. To gauge the degree to which the shahadah is central to Muslim identity, the survey asked, “Do you believe in one God, Allah, and His Prophet Muhammad?” In the majority of countries surveyed, overwhelming percentages confirm that they subscribe to this belief. In the Middle East and North Africa, the profession of faith is an almost universal creed among self-identified Muslims, with no fewer than 98% in all seven of the countries surveyed saying they believe in God and His Prophet Muhammad. Similarly high percentages in Southeast Asia and South Asia share in this core profession of faith. Among Muslims in sub-Saharan Africa, belief that there is only one God and that Muhammad is His Prophet is nearly unanimous in nine of the 16 countries surveyed: Cameroon (99%), Senegal (99%), Kenya (98%), Tanzania (98%), Niger (97%), Chad (96%), Ethiopia (96%), Mali (96%) and Ghana (95%). In the other seven countries surveyed in the region, at least eight-in-ten Muslims say they believe in the traditional Muslim profession of faith. Across Central Asia, nearly all Muslims in Tajikistan (99%), Azerbaijan (98%), Turkey (97%) and Uzbekistan (97%) profess their faith in God and the Prophet Muhammad. Slightly fewer Muslims in Kyrgyzstan (94%) share this belief, as do 83% of Muslims in Kazakhstan. In Southern and Eastern Europe, nearly all Muslims in Bosnia-Herzegovina (96%) affirm the conviction that there is only one God and that Muhammad is His Prophet. Among self-identified Muslims in Russia, about nine-in-ten (89%) share this belief. In Kosovo, 81% of Muslims surveyed embrace the shahadah, while 5% do not and 14% are unsure. And in Albania, 72% of Muslims profess their faith in one God and Muhammad as His Prophet, while 21% reject this core belief and 7% do not have a definite opinion. Belief in only one God and Muhammad as His Prophet is a unifying foundation for Muslim identity around the globe. However, this common belief does not necessarily mean that religion is equally important to the lives of all Muslims. The importance Muslims place on religion varies significantly by region. In addition, in some countries younger and more highly educated Muslims assign less importance to religion than do older and less educated Muslims. In sub-Saharan Africa, overwhelming percentages say religion is very important to them. In Senegal, Ghana, Cameroon, Guinea Bissau, Kenya and Tanzania, fully 95% or more share this assessment. In the other countries surveyed in the region, no fewer than 86% of Muslims describe religion as very important in their lives. Similar attitudes are widespread among Muslims in Southeast Asia, where nine-in-ten or more in Thailand (95%), Indonesia (93%) and Malaysia (93%) attest to the centrality of religion in their lives. In the South Asian countries of Pakistan and Afghanistan, overwhelming percentages (94% and 92%, respectively) say religion is very important to them. Fewer Bangladeshis (81%) say the same. Among Muslims in the Middle East and North Africa, solid majorities describe religion as very important. But overall the levels are not as high in the Middle East and North Africa as they are in sub-Saharan Africa, Southeast Asia and South Asia. About nine-in-ten Moroccan Muslims (89%) say religion is very important to them, followed by Muslims in Jordan (85%), the Palestinian territories (85%), Iraq (82%) and Tunisia (78%). Three-quarters of Muslims in Egypt also describe religion as very important in their lives, but significantly fewer in Lebanon (59%) say the same. Views on the importance of religion vary considerably in Central Asia. Turkey stands out from other countries in the region, with two-thirds of its Muslims saying religion is very important in their lives. In Tajikistan and Kyrgyzstan, about half (50% and 49%, respectively) share this view, while fewer in Azerbaijan (36%) and Uzbekistan (30%) feel the same. Just 18% of Muslims in Kazakhstan say religion is very important in their lives. In Southern and Eastern Europe, the role of religion is also relatively muted. In both Russia and Kosovo, fewer than half of Muslims (44%) say religion has a very important place in their lives, while roughly a third (36%) in Bosnia-Herzegovina agree. 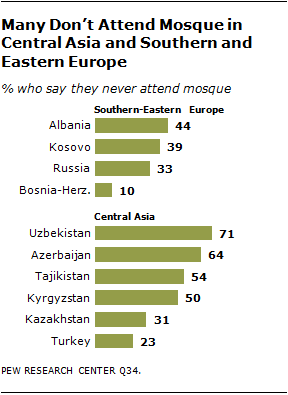 Albanian Muslims place the least emphasis on their faith, with only 15% describing religion as very important to them. In most countries, there are few consistent differences by age, gender or education when it comes to the importance of religion in Muslims’ lives. However, the importance placed on religion varies by age in a few nations. The most striking example is Lebanon, where 42% of Muslims ages 18-34 say religion is very important in their lives, compared with 71% of those 35 and older. Several other countries in the Middle East and North Africa exhibit a similar, though not as dramatic, divergence in the importance of religion for younger and older generations of Muslims. In the Palestinian territories, for instance, 80% of those ages 18-34 say religion is central to their lives, compared with 92% among those 35 and older. In Tunisia, there is a difference of nine percentage points in the importance of religion among Muslims 18-34 and those 35+ (73% vs. 82%), and in Iraq there is an eight-point difference (79% vs. 87%). Older Muslims also tend to place somewhat greater importance on religion in some of the former communist countries of Central Asia and Southern and Eastern Europe. In Tajikistan, for instance, 45% of those ages 18-34 say religion is very important in their lives, while 55% of those 35 and older say the same. Likewise, in Albania, just 11% of young adult Muslims say religion is integral to their lives, compared with 19% of the 35-and-older cohort. And in Uzbekistan, the comparable percentages are 25% and 33%. The one country where younger Muslims place greater importance on religion than their older counterparts is Russia: 48% of those ages 18-34 describe religion as very important to their lives, compared with 41% of those 35 and older. Education also affects attitudes toward religion in some of the countries surveyed. In Lebanon, for example, 68% of Muslims with less than a secondary education say religion is very important in their lives, compared with 41% of those with a secondary education or more. In Southern and Eastern Europe, too, Muslims with less education tend to value religion more. In Russia, for example, 66% of those with less than a secondary education say religion is very important in their lives, compared with 41% of those with a secondary or higher education. Salat, or prayer, is the most frequent practice through which Muslims profess their faith in one God and His Prophet Muhammad. Prayer is also universally accessible. Regardless of gender, health, income or distance from Islam’s birthplace on the Arabian Peninsula, Muslims can equally engage in prayer. The same is not true of mosque attendance, annual giving of alms, fasting during the holy month of Ramadan or making the pilgrimage to Mecca. The universal quality of prayer makes it a useful indicator of religious commitment among Muslims across the globe. According to tradition, Muslims are to offer five prayers a day, typically at daybreak, noon, mid-afternoon, sunset and evening. The survey asked how often, aside from religious services, individuals pray: several times a day, once a day, less often or never? In addition, respondents who said they pray several times a day were asked whether they observe all five salat. The survey finds that daily prayer features prominently in the lives of Muslims in sub-Saharan Africa, Southeast Asia, South Asia and across the Middle East and North Africa. In the countries surveyed in these regions, six-in-ten or more in all but one country say they pray at least once a day; the exception is Tanzania, where 55% pray at least once a day. Muslims in Southern and Eastern Europe and in Central Asia are generally less likely to pray at least once a day, although there is considerable variation within the two regions. In Central Asia, for example, nearly three-quarters of Azerbaijani Muslims (74%) say they pray once a day or more, compared with one-in-ten Muslims in Kazakhstan. In many of the countries surveyed, most Muslims who say they pray daily do so at least several times a day. Among the regions included in the study, Muslims in sub-Saharan Africa tend to pray most frequently. In 14 of the 16 countries surveyed in the region, majorities say they pray at least several times a day, including half or more who observe all five salat from dawn through evening. Only in Tanzania (48%) and Mozambique (41%) do fewer than half pray several times a day. Prayer is also central to the lives of Muslims in Southeast Asia. More than three-quarters in Malaysia (79%), Thailand (78%) and Indonesia (77%) say they pray several times a day. This includes at least seven-in-ten in all three countries who say they perform all the salat. Further to the west, in Afghanistan, the overwhelming majority (91%) of Muslims say they pray multiple times each day, with about the same percentage performing all five salat (88%). Fewer Muslims in Pakistan (50%) and Bangladesh (39%) pray several times a day, while even smaller percentages (42% and 30%, respectively) observe all the salat. Across the countries surveyed in the Middle East and North Africa, prayer is a common part of life for Muslims, with six-in-ten or more saying they pray several times a day. Iraqi Muslims particularly stand out, with 83% reporting that they perform all five salat in the course of a day. Fewer than seven-in-ten in nearby countries say the same, including about half of Egyptian Muslims (53%). In general, Muslims in Central Asia pray much less frequently than their counterparts in other regions. Azerbaijani Muslims are an exception, with seven-in-ten reporting that they pray several times a day. Fewer than half of Muslims in Turkey (42%), Tajikistan (42%), Kyrgyzstan (18%) and Uzbekistan (17%) pray as often. In Kazakhstan, relatively few Muslims (4%) say they pray several times a day. Although a majority of Azerbaijani Muslims say they pray several times a day, only about one-in-five (21%) observe all five salat. In Central Asia, Tajik Muslims are the most devout in this regard, with 39% performing the five required prayers each day. Elsewhere in the region, fewer than three-in-ten perform all five salat, including just 2% of Muslims in Kazakhstan. Daily prayer is also less common in Southern and Eastern Europe. In none of the countries surveyed in the region do a majority of Muslims pray several times a day, and fewer than a third of Muslims in these nations observe all five salat from dawn through evening. When it comes to differences by age, it is especially in the Middle East and North Africa that Muslims 35 and older are more likely than their younger counterparts to pray several times a day. The greatest disparity in the frequency of prayer is in Lebanon, where 75% of those 35 and older pray more than once per day, compared with 47% of Lebanese Muslims who are 18-34 years old. 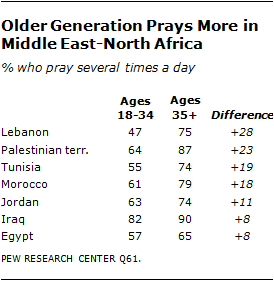 Sizable age gaps in the observance of daily prayer also are found in the Palestinian territories (+23 percentage points), Tunisia (+19) and Morocco (+18), with those 35 and older consistently praying more often than younger adults. Smaller, but significant, differences are observed elsewhere in the region. In some of the other regions surveyed, observance of daily prayer also differs by age cohort. In Central Asia, for instance, sizable gaps in the frequency of prayer among those 35 and older and those 18-34 are found in Uzbekistan (+18 percentage points), Tajikistan (+16 points) and Kyrgyzstan (+8). In Southeast Asia, older people similarly are more likely to pray several times a day – by an 86% to 74% margin in Malaysia and 81% to 73% in Indonesia. As with other religions, in the Islamic tradition prayer can be either an individual or a communal act. Friday is the day of the week when Muslims around the globe typically gather at their local mosque to worship together and observe jumah, or Friday prayer. As a measure of religious commitment, the survey asked Muslims not only whether they attend jumah prayer but also whether they go to a mosque at other times of the week. Across the regions surveyed, the percentage of Muslims attending mosque at least once a week is highest in sub-Saharan Africa. More than nine-in-ten Muslims in Ghana (nearly 100%), Liberia (94%), Uganda (93%), Ethiopia (93%), Guinea Bissau (92%), Mozambique (92%) and Kenya (91%) say they visit their local mosque at least weekly. Elsewhere in sub-Saharan Africa, roughly two-thirds or more in every country surveyed report the same. In other regions, rates of mosque attendance tend to be lower. In South Asia, for example, 61% of Muslims in Afghanistan say they visit their local mosque at least once a week, while 59% in Pakistan and 53% in Bangladesh say the same. In Southeast Asia, meanwhile, 72% of Indonesian Muslims attend mosque at least weekly, compared with 57% of Muslims in Malaysia and 52% in Thailand. Across the countries surveyed in the Middle East and North Africa, the percentage of Muslims who say they attend mosque at least once a week ranges from about two-thirds in Jordan (65%) to roughly a third in Lebanon (35%). Rates of mosque attendance are relatively low throughout Central Asia and across Southern and Eastern Europe. Turkish Muslims are the most frequent mosque visitors, with 44% saying they do so at least once a week. Muslims in Bosnia-Herzegovina and Tajikistan are the next most likely (30%) to attend at least once per week. Among Muslims who attend mosque at least once a week, many pay repeated visits between Friday prayers. This is especially true in sub-Saharan Africa, where at least four-in-ten Muslims in each country surveyed report attending mosque multiple times each week. In South Asia and Southeast Asia, at least one-in-three Muslims say they attend mosque more than once a week, while in the Middle East and North Africa the percentage of Muslims attending mosque multiple times each week ranges from 15% in Lebanon to 38% in Tunisia. Relatively few Muslims in Central Asia and across Southern and Eastern Europe visit their local mosque more than once per week. Across these two regions, Turkish Muslims are the most likely (19%) to attend mosque multiple times a week. At the other end of the spectrum, substantial percentages of Muslims report never attending mosque. This response is most common in Central Asia, where half or more in Uzbekistan (71%), Azerbaijan (64%), Tajikistan (54%) and Kyrgyzstan (50%) say they never visit their local mosque. In Southern and Eastern Europe, roughly a third or more in Albania (44%), Kosovo (39%) and Russia (33%) report the same. Across the three countries surveyed in South Asia, more than a quarter say they never attend mosque. In the Middle East and North Africa, the percentage that says they never frequent their local mosque ranges from 4% in Egypt to 34% in Iraq. Overall rates of mosque attendance can disguise the fact that in some countries women are constrained by custom or other considerations from visiting their local mosque. Countries in Central Asia and South Asia stand out in this regard. For example, Tajik women are 79 percentage points more likely to say they never attend mosque than Tajik men (93% vs. 14%). Women are also much more likely to say they never attend mosque in Afghanistan (+78 points), Bangladesh (+75), Kyrgyzstan (+65), Uzbekistan (+54) and Pakistan (+54). In the Middle East and North Africa, the gap between women and men who never attend mosque ranges from 56 percentage points in Iraq to two points in Egypt and Morocco. In sub-Saharan Africa, the gender differences in non-attendance are generally smaller: six points or less in 12 of the 16 countries surveyed. However, sizable gaps are found in Senegal (+25 percentage points), Cameroon (+18), Niger (+16) and Chad (+13). The survey finds that age can also be a factor in mosque attendance. For instance, across the seven countries surveyed in the Middle East and North Africa, Muslims ages 35 and older are consistently more likely than those ages 18-34 to attend mosque at least once a week. The largest age gaps in mosque attendance are found in Lebanon (+20 percentage points), followed by Tunisia (+17), Egypt (+15), Morocco (+15) and Jordan (+13). In Southeast Asia, similar age gaps in mosque attendance are found in Thailand (+14 percentage points) and Indonesia (+11). In other regions, age is not a consistent factor in mosque attendance. Reading from or listening to the Quran – the holy book of Islam – is another practice through which Muslims affirm their belief in God and His Messenger Muhammad. The survey asked respondents how often they read or listen to the Quran – every day, once a week or less, or never. Reading or listening to the Quran is most common in the Middle East and North Africa, where most people are native speakers of Arabic, the language of the Quran.12 About half of Muslims in Jordan (52%), the Palestinian territories (52%), Tunisia (51%) and Egypt (49%) report that they read or listen to Islam’s holy book on a daily basis. In Morocco (39%) and Lebanon (31%) at least three-in-ten say the same. In Southeast Asia, reading or listening to the Quran is somewhat less common. In Thailand, 48% of Muslims say they engage in this practice each day, compared with fewer in Indonesia (37%) and Malaysia (35%). In South Asia, daily reading or listening to the Quran is most prevalent in Afghanistan (43%), followed by Pakistan (36%) and Bangladesh (15%). Daily reading or listening to the Quran is relatively rare in Central Asia and across Southern and Eastern Europe. The practice is most common in Kyrgyzstan, where 18% say they engage in this practice every day. In other countries surveyed in the two regions, no more than one-in-ten read or listen to the Quran on a daily basis. As in the case of prayer and mosque attendance, older Muslims in many cases are more likely than their younger counterparts to read or listen to the Quran. This is especially true in the Middle East and North Africa, where the percentage of those 35 and older who read or listen to the Quran daily is as much as 19 percentage points higher in the Palestinian territories and Morocco. Other significant gaps between older and younger Muslims are found in Lebanon (+18 points), Iraq (+14 points), Jordan (+13), Tunisia (+12) and Egypt (+8). Outside the Middle East and North Africa, however, reading or listening to the Quran does not vary consistently by age. In contrast with mosque attendance, the gap between women and men in terms of daily reading or listening to the Quran tends to be small or nonexistent. Only in Pakistan do significantly more women than men read or listen to Islam’s holy book each day (46% vs. 26%). Afghanistan is the one nation surveyed where significantly more men than women (51% vs. 33%) read or listen to the Quran each day. The practice of giving zakat, or alms, is another central pillar of Islam. By tradition, all adult Muslims who are able are expected to annually contribute 2.5% of their accumulated wealth (not annual income) to aid the poor, sick and otherwise needy. In some countries, such as Malaysia and Pakistan, government agencies collect zakat, but in most cases donations are made through mosques or religious organizations.13 Impoverished individuals for whom giving zakat would be a burden are exempt from the annual alms requirement. In 36 of the 39 countries surveyed, majorities of Muslims say they engage in the traditional giving of alms. In Southeast Asia, this includes nearly all Muslims in Indonesia (98%) and more than nine-in-ten in Malaysia (93%) and Thailand (93%). Rates of annual almsgiving are nearly as high in South Asia, with roughly nine-in-ten in Afghanistan (91%) and Pakistan (89%) observing zakat. Fewer in Bangladesh (78%) report giving alms. Among the countries surveyed in the Middle East and North Africa, Morocco stands out, with 92% of Muslims saying they make annual donations to the poor. At least seven-in-ten in the Palestinian territories (84%), Tunisia (81%), Iraq (79%), Lebanon (78%), Jordan (74%) and Egypt (70%) also give alms annually. Rates of zakat observance in sub-Saharan Africa range from 89% in Liberia to 58% in Mozambique. In most of the countries surveyed in the region, two-thirds or more of Muslims say they annually donate a percentage of their wealth to charity or the mosque. Although the practice of giving zakat tends to be less common in Central Asia and across Southern and Eastern Europe than in other regions, substantial percentages of Muslims living in these areas nonetheless observe this central obligation. For example, roughly two-thirds or more in Bosnia-Herzegovina (81%), Kyrgyzstan (77%), Uzbekistan (73%), Turkey (72%), Kosovo (69%) and Tajikistan (66%) say they give alms annually. Substantial minorities in Albania (43%), Russia (39%) and Kazakhstan (36%) do the same. Abstaining from food and drink during the day and breaking the fast only after sundown is a core practice associated with the holy month of Ramadan. Observance of the annual fast is widespread across most of the countries surveyed. In Southeast Asia, for example, abstinence from food and drink during the Islamic calendar’s ninth month is nearly universal in Thailand (nearly 100%), Indonesia (99%) and Malaysia (99%). Fasting during Ramadan is also practiced by the overwhelming majority of Muslims in the South Asian countries of Pakistan (97%), Afghanistan (96%) and Bangladesh (96%). Similarly high percentages observe the annual rite in much of the Middle East and North Africa. At least eight-in-ten Muslims in every country surveyed in the region say they avoid eating and drinking during the daytime throughout Ramadan. In sub-Saharan Africa, too, a high proportion of Muslims report that they observe the annual fast. Participation ranges from 69% in the Democratic Republic of the Congo to nearly 100% in Cameroon. In Central Asia and across Southern and Eastern Europe – where Muslims tend to pray, attend mosque and read the Quran less often than their counterparts in other regions – the annual fast also is fairly common. In Central Asia, more than eight-in-ten Muslims in Tajikistan (88%) and Turkey (84%) say they abstain from eating or drinking in the daytime during Ramadan. In Kyrgyzstan and Uzbekistan, roughly half do so. Only in Azerbaijan (43%) and Kazakhstan (30%) do minorities of Muslims observe this annual rite. In the four Southern and Eastern European countries surveyed, majorities of Muslims fast in the month of Ramadan in all but Albania (44%). In Russia, 56% fast during the day, while about three-quarters do so in Kosovo (76%) and Bosnia-Herzegovina (75%). According to Islamic tradition, all Muslim adults are required to participate in the annual hajj, or pilgrimage, to Mecca at least once in their lifetime unless they are physically or financially incapable of making the journey. Especially for Muslims who live far from Saudi Arabia, the pilgrimage often entails major expense and effort, and few Muslims across the 39 countries surveyed report having made the journey to Islam’s holiest city. Indeed, in no country does a majority say they have completed the hajj14. Many pilgrims to Mecca reside in the Middle East and North Africa, with a median of 17% saying they have completed the hajj. Proximity to Saudi Arabia may be a key factor in whether an individual has made the journey. For example, Muslims in Egypt (20%), Lebanon (20%), Jordan (18%) and the Palestinian territories (17%) are much more likely to have performed the hajj than their counterparts in Morocco (6%) and Tunisia (4%). 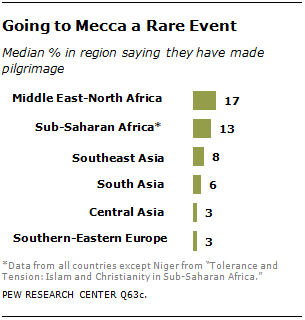 Muslim pilgrims from sub-Saharan Africa also are relatively prevalent: a median of 13% of Muslims surveyed across the region have completed the hajj. This includes about half (48%) in Djibouti, which is relatively close to the Arabian Peninsula. More than a quarter in Liberia (32%), Chad (28%) and Guinea Bissau (27%) also say they have made the pilgrimage. 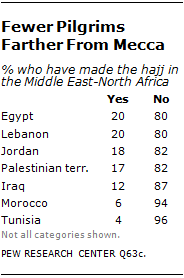 In the other countries surveyed in the region, roughly one-in-five or fewer has been to Mecca. Pilgrims are far rarer in Southeast Asia and South Asia. The median percentage of Muslims in Southeast Asia who have made their way to Mecca is only 8%; in South Asia, the median is 6%. In Central Asia and across Southern and Eastern Europe, meanwhile, a median of only 3% in each region have completed the hajj.